Last updated 18:00GMT, Sunday 8 February. TODAY: warning about trees down during high winds on major roads in South of France, A7, A9 + A54 (see below + @VinciAutoroutes). Frejus Tunnel now re-opened to trucks and transit buses. Snow A12>Innsbruck, A9 Graz-Linz, A10 Salzburg, S6 Leoben-Vienna + now A13 Brenner, Austria. High winds cancel ferries Greece, recovering from snow storm Croatia + roundup snow Bulgaria. High winds and snow Scandinavia – Storm Ole heading east from Norway via Sweden, expected to ‘weaken’ as it hits west Finland (drive warning update) but major blizzard expected Moscow today. Northern Spain: recovering after heavy snowfall. A67 Santander-Palencia has re-opened. Other major routes clear but chains mandatory in the mountains. See DGT website for latest, black mark is closed, red is chains needed. CHANNEL DELAYS: Brittany Ferries Plymouth-Roscoff/St Malo disrupted/cancelled until tomorrow. WEATHER ALERT: amber alert high winds France, Norway, Finland, Poland, Estonia, Latvia, Austria, Montenegro, Italy, snow Poland, Slovakia, Austria, Hungary, Italy, Greece low temperatures Croatia, heavy rain Italy, Greece. WEATHER: settled West, heavy snow East (north to south). MAJOR TRAFFIC DELAYS: A9 southbound to Nimes, incident Remoulins delay 45mins. A60 southbound to (Trier), major accident Bitburg/Bickendorf delay down to 45mins. A1 both ways Linz-Vienna, earlier multi-vehicle accident Amstetten, re-opened westbound; delay down to 45mins eastbound. Earlier: A12 westbound to Innsbruck, weather, heavy traffic, total delay down to 10mins. B179 Fernpass northbound Reutte-Fussen, heavy traffic, earlier incidents, total delay still 15mins; now no delay southbound. Demonstrations are expected to clog traffic in Paris today, and cities around France tomorrow. Biker demo through Paris this afternoon, departing Chateau Vincennes in the east at 14:00 then heading into the city centre via Avenues Daumesnil, Lyon, Bastille, St Antione, Rivoli, Coutellerie and Victoria (according to @cricreteil) – basically the major roads parallel to the Seine in the north (no sign of major disruption yet though 3,000 bikes have apparently turned up). Protesting over plans to ban older bikes from the city, due to be discussed in the city council tomorrow, see more. Also, another bike demo is called for Monday morning 08:00-12:00 Place du Chatelet (off Avenue Victoria). 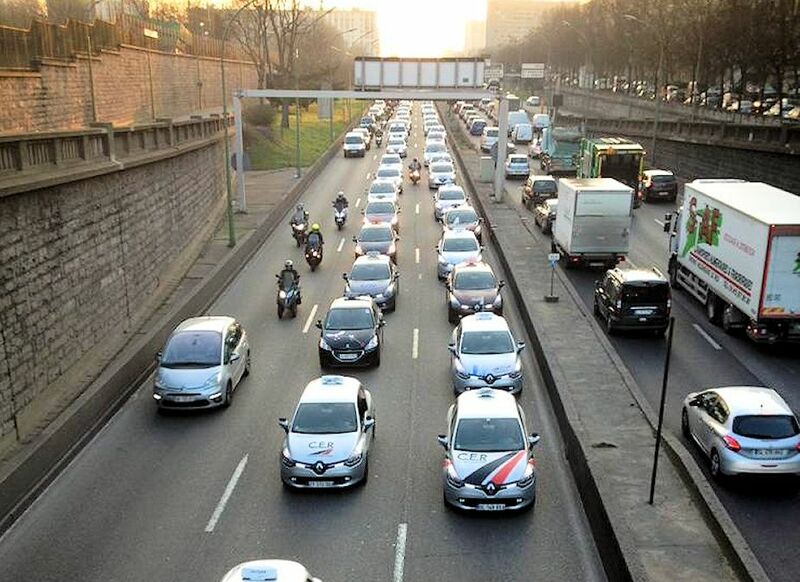 Driving schools are also set to re-run their demo of last Monday when they clogged the Boulevard Peripherique ring road. Gathering at 07:00 at Roissy (Charles de Gaulle Airport, north Paris) then heading into city centre via A1 and A3 (actually another demonstration by taxis). Another driving school demo is planned between Rosny sous Bois in the east, Porte d’Auteuil in the west and Place Vauban central south. Not planned to finish before 18:00. There may also be driving school demos in other cities around the country, see more (and this from The Connexion).